How many of you gorge yourself with food over the holidays with the thought that you will go on a strict diet the following day, Monday or even the next year? It’s an all-or-nothing mentality that ends up making you heavier overall, less healthy, and disappointed with yourself. If you watch your weight, you know what I’m talking about! 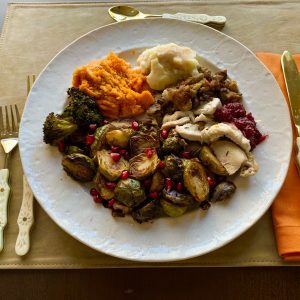 I have five tips to help you to enjoy your holiday food without sabotaging your weight or your mental state. 1) Take small bites and chew your food thoroughly before swallowing. You probably don’t even realize that you swallow your food before completely chewing it. Check it out the next time you take a bite. You may be surprised! I’m asking you to enjoy your food MORE rather than quickly swallowing it and moving on to the next bite. Who doesn’t want to enjoy their food more? Chewing completely also gives your brain more time to recognize fullness and more time for the break down of your food. 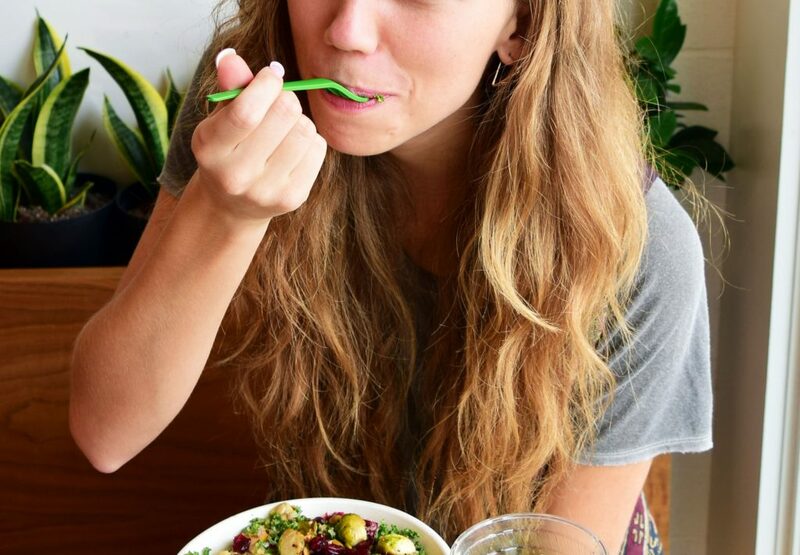 Did you know that you start to digest your food in your mouth? So chewing more improves digestion by allowing you more time to break down your food in your mouth and gives your body more time to release digestive enzymes to digest your food as it goes down. 2) Stop eating when you are feeling full. Listen to your body! It’s saying something to you, but by around three years of age in the U.S., we become conditioned to listening to outside factors like how much is in front of us or the time of day rather than our internal cues. 3) Choose your three top food picks before eating. Look over all the food first so you can select your top three favorite foods to eat. Eat those favorite choices along with half vegetables and fruit on the smallest plate available. If you want seconds, go for the vegetables and fruit. If possible, bring a healthier dish to share that you will eat and enjoy. 5) Drink water as much as possible throughout the event. If skipping caloric beverages (either alcoholic or not) is a problem, have a glass of water in-between each caloric drink. Caloric drinks bring blood sugars up quickly and keep blood sugars up longer than eating food. Higher blood sugars often mean your body ends up in fat making mode more quickly and for longer than if you eat your calories. Plus, drinking water helps keep you full and eating less food. There you have it: a new way of thinking about your holiday meals.  Now, these are tips you can apply! Right? Try all five tips or even just one to make a difference to your health, weight, and self-esteem. 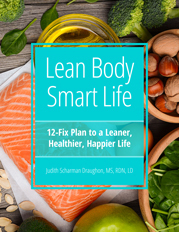 These tips come straight from my book, Lean Body Smart Life: 12-Fix Plan to a Leaner, Healthier, Happier Life (Amazon), where I narrowed down the science to the 12 most important changes you can make to benefit both your health and your weight. Happy Holidays! Judith Scharman Draughon, MS, RDN, LD (aka Judes) is a registered, licensed dietitian nutritionist. Judes inspires many with her high-energy wellness presentations. She is the creator of the 12-Fix Lean Life Plan, author of Lean Body Smart Life, and owner of Nutrition Educational Solutions, (known as “Foods With Judes”). She also taught at the International Culinary Arts and Sciences Institute, along with various clinical positions through the years. She recently relocated to North Carolina and is learning how to be Southern. Connect with Judes through her website FoodsWithJudes.com and LinkedIn. She can also be found at Foods With Judes on Instagram, Facebook, Twitter, and Pinterest.